On Thursday, November 8th I Blogged to you an engineering drawing showing the details of my first workshop cabinet. I made this drawing to give myself a starting size for the drawers. However, there is really no way to know in advance how much drawer space I will need to hold all of my stuff. So, what I am doing is first fabricating drawers and putting my stuff in those drawers. This will show me how my stuff fits in the drawers and what size drawers I will need for all of my stuff. Yesterday I completed fabricating (6) 4" high drawers. Today I will go thru all of my stuff and put items in those (6) drawers. Then, I'll decide how many taller drawers are needed. You may recall my November 9th engineering change when I decided to build (1) 12" high drawer to accommodate dispenser bottles [ie: Formula 409]. I would like to Blog to you about the Readers who have commented that it will take me a year to complete Box Van's construction. These Readers are correct if they mean 100% completion. I myself am not all interested in 100%! I sorted thru all my stuff now being kept in plastic storage containers. Then, put all of that stuff that would fit into my newly fabricated wood drawers. Next, I unloaded the (2) steel cabinets. These steel cabinets are the ones that were installed in Señor Tránsito. After the (2) steel cabinets were empty, I drove to Goodwill and donated these cabinets to them. 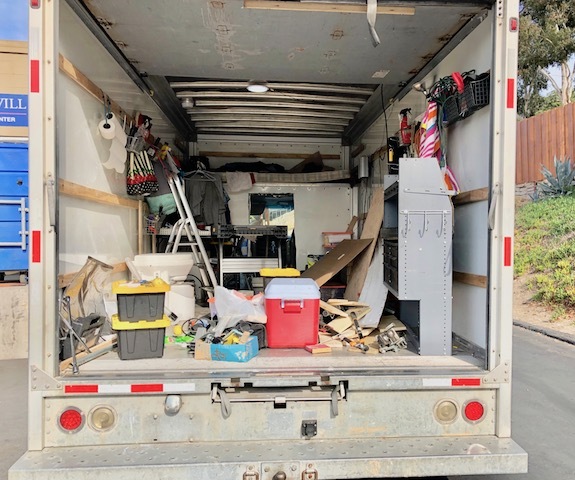 Box Van with one of the donated steel cabinets removed. A couple of days ago, Mister Ed commented to me about a small fan to circulate air inside Box Fan. 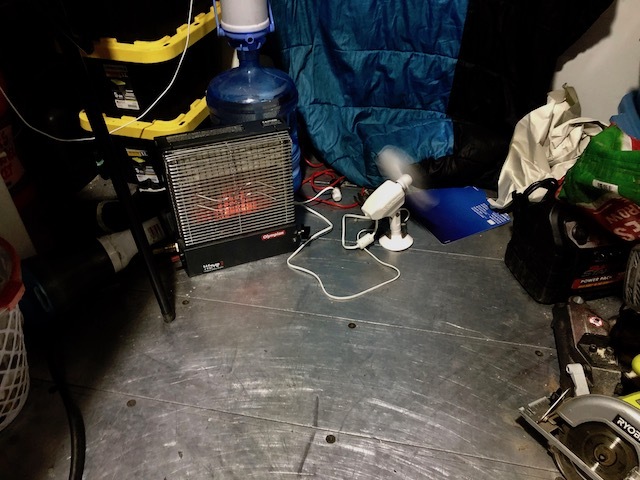 According to Ed, this small very low electric usage fan would circulate the air heated by my Olympian Wave-3 Catalytic. And Ed predicted the temperature inside Box Van would rise. Right now, the temperature in the City of Lemon Grove is 58℉. Inside Box Van it's 68℉. So, Mister Ed is right-on-target again! Caframo [Brand] fan from West Marine. how tall will the raised floor and what will be under it? The raised floor will contain insulation material. Since I am intending to use R-TECH 1" thick x 4 ft. x 8 ft. R-3.85 Insulating Sheathing,, the floor will likely be 1" high. In my RV we put an 2000 W Xantrex Pure Sine Wave inverter/Charger. We replace the inver in the RV. Fits perfect in the same location that the 12v Inverter was. I also installed a 12v pancake fan. Because there was no fan to cool the inverter the fan has a thermostat on it when the area around the inverter gets above 85 deg the fan starts. I put the inverter and the fan and my solar system on my RV in Aug of 2006. I replaced all the battery's in the RV in 2016 replace the batteries from wet batteries to AGM Batteries. Also I like your idea about building an "Old U-Haul type truck into an RV. You could probably park the incognito living quarters vehicle for a week or more on any street in San Diego County and nobody would even think twice about it sitting on their street , But you put a 30ft RV and people will be watching it and waiting for it to give birth. I like your comment being, "..incognito.." in San Diego and nobody would even think twice! Here in my comments, when a Reader claims to be "not serious", it usually means that I have caught them being nasty. All of the stored stuff [In plastic boxes] is taking up considerable space. Attempting to do construction of my living quarters before the workshop's storage cabinet is complete would be extremely chaotic. 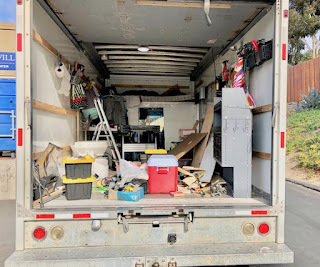 If you have things that you consider stuff means you don't need them right away That would be a candidate for U-Haul and storage cubicle See I've gotten rid of half of your STUFF All already. Buddy Hackett and George Carlin!!! I love it when you help me! "Scoff", is a bit harsh! I would never, ever, never, ever, ever.... put a used dresser into my beloved Box Van! If you need a pic, I'll send you one. But with your intellect, is there a need? Thank you so much for your vote of confidence! I think you are loosing a lot of usable space by not raising the bed platform enough to have storage under it. The area of the bed by 1 foot high is a lot of storage space. Plus the additional height would make it easier to get into and out of bed. Thank you for pointing that out to me! I am grateful!! Donating those cabinets was a good idea,George! Now you will have more room to work and live in, and someone else will get cabinets they need inexpensively at the Goodwill. Thank you sooooo much for your confidence in me to finish the project quickly! You are right! There is a lot more room now that Señor Tránsito's steel cabinets are gone. When I find who stole my plates, they will pay dearly! PS: The fan that you recommended arrived today!! Did you ever get your compound miter saw ? Will you not have a water tank or a composting toilet? I have both a fresh water tank and a composting toilet. I have been using the Natures's Head Composting toilet for several weeks. The fresh water tank is not yet in service.